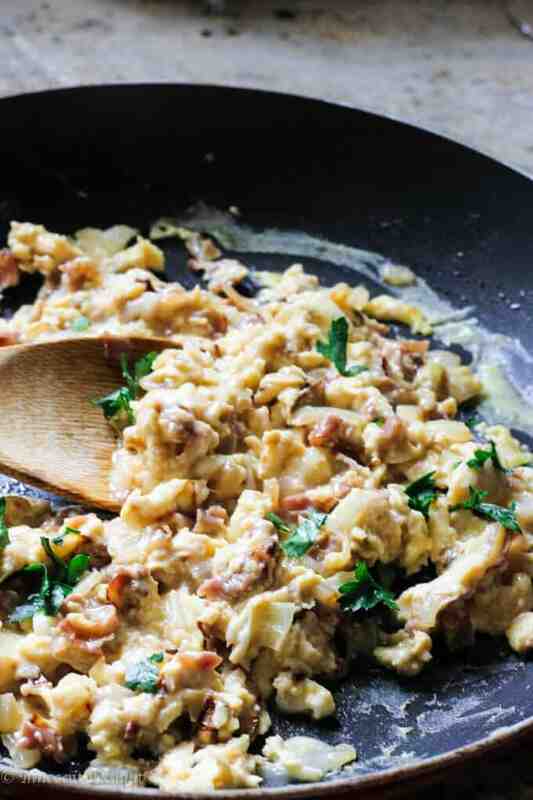 Scrambled Eggs with onions, prosciutto and mozzarella – a killer breakfast with an italian twist. Weekends are pretty special for us. We work hard for the entire week and see each other for a few minutes in a morning and a few hours in the evening. That’s why we really cherish our Saturdays and Sundays. I always make some killer breakfasts. In turn my husband makes fresh squeezed orange juice and coffee and then we all watch tv shows together. Until recently we either watched food network (my favorite) or House Hunters International on HGTV. This has shifted recently when our 13 months old son started demanding his Bubble Guppies cartoons. It’s really funny…he grabs the remote, comes to me, hands it over and makes a noise to compel me to turn on his Guppies. When he sees me pushing the buttons and searching for his beloved cartoon he gets so excited, claps his hands and laughs. So now, our weekend morning show is Bubble Guppies; which we actually enjoy – or at least I do. Another new thing for us is that our son wants to eat whatever we’re eating from our plates, which is pretty cool. I hope this will teach him good habits and he won’t be a picky eater. At least this is my pediatrician theory, and I want to believe it too. So every weekend we have a family breakfast and our little one eats with us. 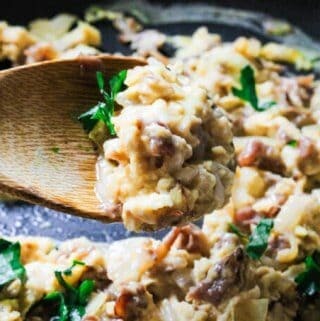 Recently I made scrambled eggs with an italian twist. 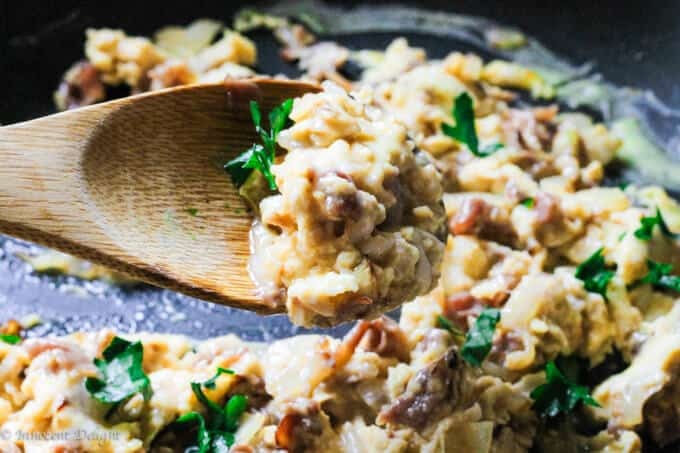 I had plenty of prosciutto from Costco and was searching for a creative ways to use it. I took some onions, chopped and sautéed them with a tablespoon of butter. Later I added cut pieces of prosciutto in and let it cook with the onions until slightly crispy. Then I added my egg mixture and cooked until almost set. At the end I added shredded mozzarella cheese and let it melt into the eggs. The result was divine. 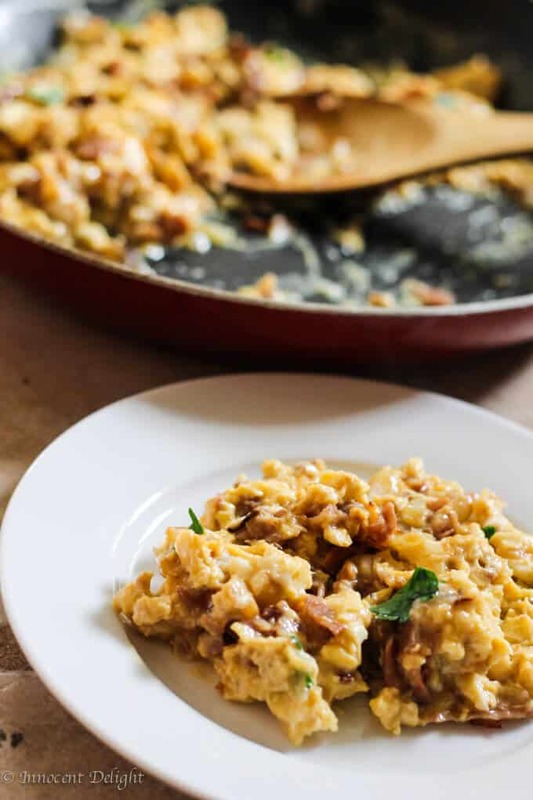 The sweetness of onions with the salty prosciutto and creamy eggs with melted cheese just made a killer egg breakfast with an italian twist. And to my biggest surprise, my little one loved it too! I chopped his portion into very small pieces and it turns out he couldn’t stop eating it. I actually don’t blame him, as this breakfast was really spectacular. I recreated it when my in-laws were in town and they just kept saying how wonderful this dish was. And the best thing is, that it’s super easy to make. It takes no more than 15 minutes. So, if you happen to have excess prosciutto at home (or even if you don’t), definitely give it a try. It’s one of those dishes that will stay with you forever. 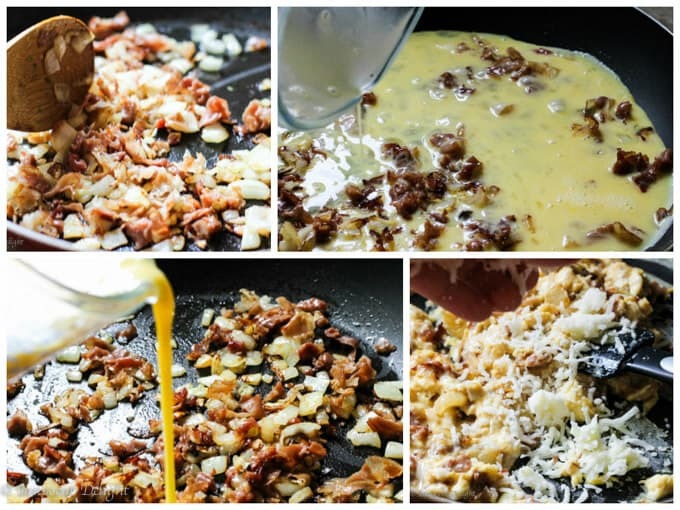 At the end add mozzarella cheese and cook it until the cheese melts. Serve immediately with a piece of fresh bread on a side. What a great idea for breakfast . I’m also a big fan of House Hunters International , I watch it at night before I go to sleep. Thanks Gerlinde. Try it some time and let me know how it worked out.